As you know by now, few months ago I built 433 MHz control of power sockets using rc-switch. Since then, I somehow lost remote control for it so I decided to have more permanent solution than bunch of wires. This time around I also used USBee AX Pro clone to check voltage levels which meant that I first had to make it work on Linux. You can see final result on picture included in this post. 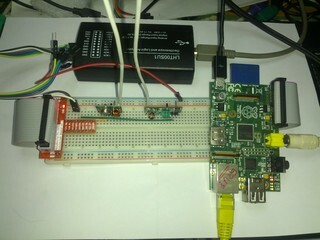 It was mixed experience which included few surprises which might be useful to other people doing hacking with Raspberry Pi, so I decided to write this post. As I'm somewhat cheap, I didn't want to buy Adafruit Pi Cobbler but instead went with Raspberry Pi GPIO adapter board module which has additional benefit of routing 5V and 3.3V to power rails on breadboard. I already had 26 pin cable, but if you don't have one, make sure you get that also. Breakout board also have markings for wiringPi (as opposed to one of other variants of GPIO pins on pi). When breakout board arrived I noticed something interesting: it requires power pins which are aligned with holes on main board. Examine picture below to see difference. As you can see on top 400 point breadboard, power pins are in the middle pins of main area which means that you won't be able to plug in breakout board into power rails. I was fortunate enough that another 800 point breadboard had power pins aligned with main area, but none of smaller 400 point breadboards I have are correctly aligned. 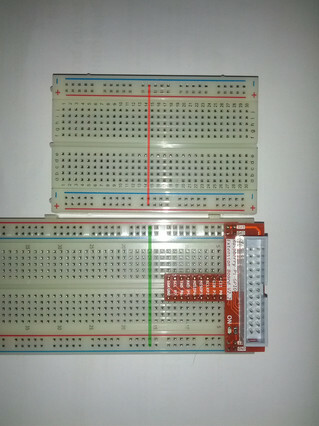 Picture on seller's site does show 400 point breadboard, but adapter board shows V2.0 while mine is V2.2, but judging from picture 400 point breadboards with aligned pins do exist. 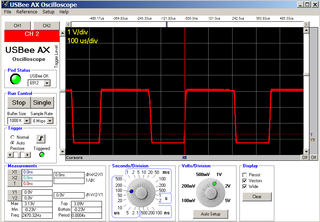 This time around, I also received USB Oscilloscope and logic analyzer which includes two analog ports which is clone of USBee AX Pro so I decided to see signals which receiver generated using it and picture is included below. As you can see, I was forced to use Windows XP in virtual machine to make it work. Although there is free software support for logic analyzer part of it in sigrok developers aren't really excited with USBee AX Pro clones so support for analog channels is missing. There is code in ax branch, but I haven't had a chance to try it yet. For few months I thought that it doesn't work at all, mostly because I was trying to make it work in kvm and VirtualBox. Finally, a friend suggested to try vmware, and it worked without a problem. Since there is open source implementation of USBee SX protocol, I think it's quite possible to extend it to support analog ports on AX Pro, but I haven't had time to do this yet. Have in mind that buying USBee Test Pod clones is not something CWAV condones, and newer versions of software from their's web site will re-flash the device (original is read only) which will make it unusable. DX has a long thread with dead links to Cypress site how to fix this, but easiest solution I found so far was to go to site of another clone called ESLA201A and download fix_esla201.rar which includes everything you need to re-flash USB ID back to USBee AX Pro in single rar archive.